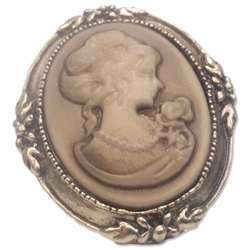 This cameo ring will compliment almost any upper class Edwardian or Victorian character including Gibson Girls. It can be used in a number of different theatrical productions especially shows by Charles Dickens, such as Oliver or A Christmas Carol. The cameo ring features a white three dimensional female portrait on a dark background (background color may vary). The ring has an adjustable band for one size fits most sizing. Mix and match this ring up with our other cameo costume jewelry or pair it up with a Victorian blouse or costume.